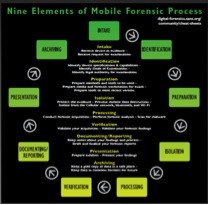 Practical Mobile Forensics is RELEASED! 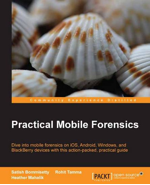 This book was written by three of us hoping to guide those new to mobile forensics and those looking to branch into mobile device forensics. We provide practical methods for acquiring and analyzing data from smartphones and place an emphasis on open source tools, where possible. Speaking of open source, the latest version of Autopsy is available and can be downloaded here: http://sourceforge.net/projects/autopsy/files/autopsy/3.1.0%20Beta%201/. This is a beta version, so your feedback is greatly appreciated. Let me know what you think of the Android module. What is missing? Where should we focus our efforts? There is one certain thing in the DFIR field, and that is that there are far more facts, details and artifacts to remember than can easily be retained in any forensic examiner’s brain. SANS has produced an incredibly helpful array of Posters and Cheat Sheets for DFIR in order to assist examiners with those tidbits of information than can help to jumpstart their forensics exams and or intrusion and incident response investigations. The most recent addition to the SANS DFIR poster collection is the Advanced Smartphone Forensics Poster, created by SANS FOR585 authors Heather Mahalik, Domenica Crognale, and Cindy Murphy. Commercial tools have a difficult standard to live up to in regards to data decoding and don’t fully address the challenges of mobile malware detection and analysis. With all of the apps available, it’s nearly impossible to automate the process of decoding all of the relevant data. The Advanced Smartphone Forensics poster will help walk you through the basic steps of mobile malware detection and analysis, and provides you with common evidence locations for the major smartphone platforms to help you narrow down and efficiently identify data that is important to your investigation. 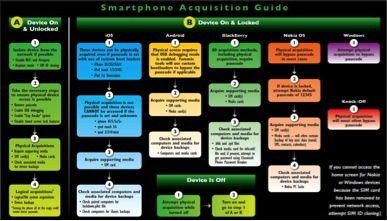 Use this poster as a handy reference guide to help you remember how to handle smartphones, where to obtain actionable intelligence, and how to recover and analyze data on the latest smartphones and tablets. 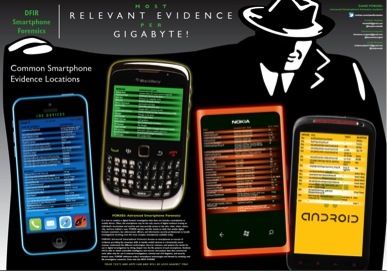 Whether you’re new to smartphone forensics or you’re an experienced examiner, the SANS Advanced Smartphone Forensics Poster will help you get the most relevant evidence per gigabyte. Windows Phone 8 – Where is that data hiding? Monkeying Around with Windows Phone 8 A fantastic write up by Cheeky4n6monkey on his work he completed with Detective Cindy Murphy on a Windows Phone 8. This is by far the most detailed work I have seen so far on a Windows Phone device. A must read!